Foals' Antidotes played like a dance-punk opus inspired by the likes of the Faint. It was followed up by Total Life Forever, a record that transitioned the band into the realm of post-disco-punk / progressive rock. To say that Total Life Forever was polished would be an understatement - the album set the band on the path of being the next "big" band and sharing the limelight with TV On The Radio. With Holy Fire, the band's superb songwriting does not shine through like their earlier releases, but rather fizzes out. 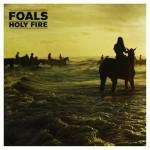 Foals usually start their albums with a band, especially the second track on each of their albums. Total Life Forever's Miami and Antidotes' Cassius both stood out as worthy singles, yet with Holy Fire's Inhaler, it starts strong but ends up becoming the equivalent of a bar-rock jam. It plays like an empty, soulless anthem that is played at a sporting event, completely alien to the heart felt in Total Life Forever. Inhaler opens with an effect-laden, palm-muted guitar noodling riff, leading up to Yannis Philippakis' droney verse of stick and stones, they'll break my bones. The chorus then opens up with a loud, sustained explosion of sound that comes off as more of a gimmick then a musical build-up. The first half of album feels like a stamped pattern, where each track is just slightly tweaked from the last. Following right after is My Number, a track that surprisingly follows the same guitar noodling meets bad chorus formula of its precursor. Then half way through Foals' tribute to guitar picking, Late Night once again takes advantage of the wonders of guitar noodling by slightly changing it up with a droney verse. It truly does feel like the same track was just simply recycled; it would be hard to be convinced otherwise. I often hate to see bands that simply rehash the same album over and over, afraid to break their stereotypes and rely on a signature sound. By no means do Foals need to release a doppelgänger to Antidotes or Total Life Forever, but their watered down take on arena pop simply does not live up to their previous works. Through their first two releases Foals were able to showcase their evolving sound, but with Holy Fire their evolution stops dead in its tracks.